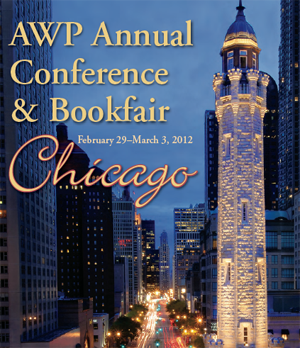 In past years, our experiences at AWP have been a flurry of panels and events. In Denver, we soaked up readings from Kundiman and Cave Canem, From the Fishhouse, and Split this Rock, attended discussions on hybrid and transnational poetry, and had fun introducing LR by word of mouth. In D.C., we spent a little time in the bookfair, hosted a joint off-site reading with Boxcar Poetry Review, were interviewed by APA Compass Radio, and attended a plethora of Asian-American-specific panels that inspired us to probe our own editorial vision more deeply. This year’s conference, however, was different. For the first time, we’d purchased and registered for a spot in the bookfair, and so I spent most of my time down in the exhibition area, manning the table that we were sharing with the lovely folks from Kartika Review. The experience, while exhausting, was wonderfully exhilarating. It was gratifying to get to meet the contributors who stopped by, life-giving to get to share resources with other young Asian American writers who were searching for community. I was encouraged after meeting the handful of teachers who came by in search of resources for particular Asian American students of theirs, and was ecstatic about having the chance to strike up conversations with the many strangers who, in spite of having little familiarity with (or even interest in) Asian American literature, stopped by the table out of sheer curiosity. In large part, I think we had our joint Pocket Broadsides project to thank for drawing many of those unlikely visitors to our table. (For a brief explanation of the project, see this post). 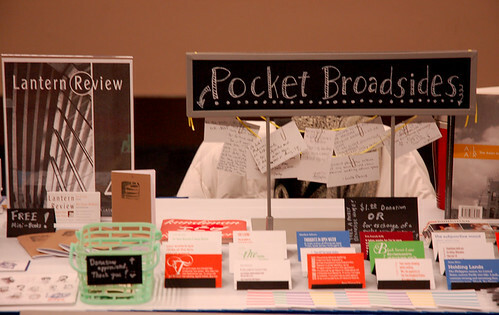 Throughout the weekend, a surprising number of passers-by stopped to examine our colorful display of business-card sized poetry and prose, and ended up staying to chat. As a result, Jennifer Derilo (Kartika‘s nonfiction editor) and I had many fruitful beginnings of conversations about what Asian American literature is, and had the opportunity to talk about and recommend the work of our contributors to people who were relatively unfamiliar with Asian American writing and writers. We were amazed by the ability the Broadsides seemed to have to attract people who might not otherwise have looked at our table. Last year, when Boxcar had been kind enough to allot us some space on their table, Mia and I had noticed that many of the people who’d paused in front of our materials had responded to our attempts at conversation with, “No, thanks, I’m not Asian American,” before beating a rapid retreat. So it was incredibly encouraging this year to see people not only stop to look, but actually talk about, the pieces that we had out on the table. I very much enjoyed getting to hear some of the stories behind why people chose particular Pocket Broadsides (one person selected a micro-prose piece based on the fact that it featured halo-halo—apparently a favorite dessert of hers, while the individual who took home Tamiko Beyer’s poem about teeth said they were going to give it to a friend who was a dentist), and it was equally encouraging to hear the stories behind the pieces that people created for us in exchange, and to see some of them return with friends in tow. By lunchtime on Saturday, all 50 broadsides were gone; Jennifer and I were floored by how rapidly they’d disappeared. 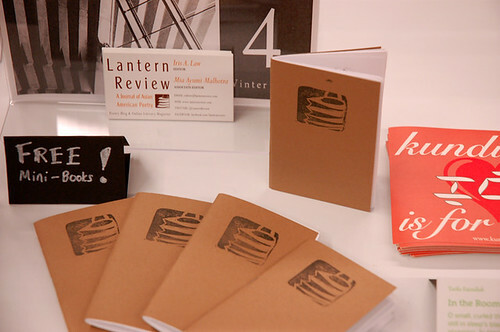 It’s that time of year again, and now that Issue 4 has successfully launched, we’re on our way to AWP. There are a few different ways you can connect with us at this year’s conference, so read on and we’ll see you in Chicago! This year we’ll be sharing a table at the bookfair with Kartika Review under the name “The Asian American Literary Collective.” This will be the best way to connect with us–so do drop by and say hello! Our table number is S16 and we’ll have information about an exciting new project (see below!) and as well as a number of other Asian American literary organizations and publications.